(WASHINGTON)—As millions of Americans prepare to travel this Labor Day weekend, a new report shows just how critical investments in transportation infrastructure projects are to the U.S. economy and quality of life. 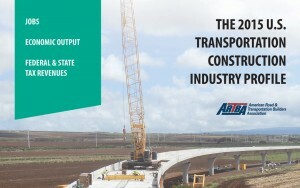 The study, authored by the American Road & Transportation Builders Association’s (ARTBA) chief economist, finds the money invested in transportation construction industry employment and purchases generates nearly $510 billion in annual U.S. economic activity—and accounts for 1.6 percent of the Gross Domestic Product (GDP). To put that figure in context, it’s larger than the annual GDP of 160 nations ranked by the International Monetary Fund, including: Denmark ($361.3 billion); Israel ($321.2 billion); Ireland ($252.6 billion); and New Zealand ($211.4 billion). The report, “The 2015 U.S. Transportation Construction Industry Profile,” by Dr. Alison Premo Black, estimates the annual value of public and private transportation construction and maintenance work will be nearly $275 billion in 2015. It ranks larger than U.S. industry sectors such as wireless communications carriers ($254 billion); food and beverage stores ($222.5 billion); insurance agencies and brokers ($219.5 billion); nursing care facilities ($171.1 billion); aircraft manufacturing ($158.3 billion); and automobile manufacturing ($131.4 billion), among others. To put these statistics and others into an easy-to-use format, ARTBA has created a website, www.transportationcreatesjobs.org, which includes a clickable U.S. map with national data. State data is also available and includes statistics on: job creation, federal and state payroll tax revenue generated, the scope and conditions of each state’s transportation network, value of freight shipments, commuting patterns and motor vehicle crashes. Dr. Black’s work also shows the industry supports nearly four million full-time jobs, which generate more than $155 billion in direct and induced wages nationally, and contribute an estimated $17.5 billion each year in state and local income, corporate and payroll tax revenue and an additional $10.9 billion in federal payroll taxes. But this is only a small part of the picture, according to Black. Without the infrastructure built, maintained and managed by the nation’s transportation construction industry, virtually all of the major industry sectors that comprise the U.S. economy—and the American jobs they sustain—would not exist or could not efficiently and profitably function. “The simple fact is that nearly 63 million American jobs in just tourism, manufacturing, transportation and warehousing, agriculture and forestry, general construction, mining, retailing and wholesaling alone are dependent on the work done by the U.S. transportation construction industry,” Black says. 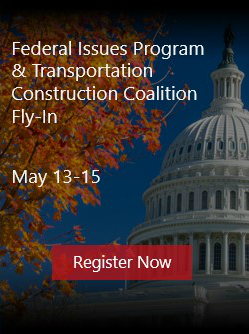 The U.S. Department of Transportation (U.S.DOT) has identified a backlog of $877 billion in highway and bridge construction projects across the country. An Aug. 26 Texas Transportation Institute-INRIX “Urban Mobility Scorecard” found that traffic congestion has returned to pre-recession levels, causing drivers to waste more than three billion gallons of fuel and keeping travelers stuck in their cars for nearly seven billion extra hours. The nationwide economic cost: $160 billion, or $960 per commuter. The recent U.S. DOT report showing that Americans drove just less than 3.09 trillion miles for the 12 months ending June 2015. This is above the 3.01 trillion miles during the same 12-month period in 2007-2008, before the Great Recession. But the supply of infrastructure has not kept up with travel demand—the number of highway lane miles grew nine percent between 1980 and 2013, while vehicle miles traveled nearly doubled, increasing 96 percent over the same time period. The U.S. Senate passed its version of a multi-year transportation bill, the DRIVE Act, by a 65-34 vote on July 30. The House is scheduled to debate its version of the legislation when it returns to Washington this month. Data in the profile was compiled using the U.S. Census Bureau’s “County Business Patterns” report and the U.S. Commerce Department’s sophisticated Input‐Output Accounts, as well as other public and private sources.